In gist: When the yummy crackers were found to be suddenly emptied out, the girls were immediately suspicious. They counted that they only ate a few out of the total, and yet none was left. Following their investigative instincts, they immediately set forth to find evidence such as biscuit crumbs, questioning those found to have no alibi (claiming to not be around at the scene), or those with potential motives (always hungry, etc). The girls slowly narrowed down the suspects, and with the art of skilful persuasion (“look me in the eyes and tell me if you ate the crackers”) and benevolence (“we understand if you were just hungry”), they had an admission of guilt, yet without shame, all openness. We make mistakes, we own up to it. This is how Forest School works. 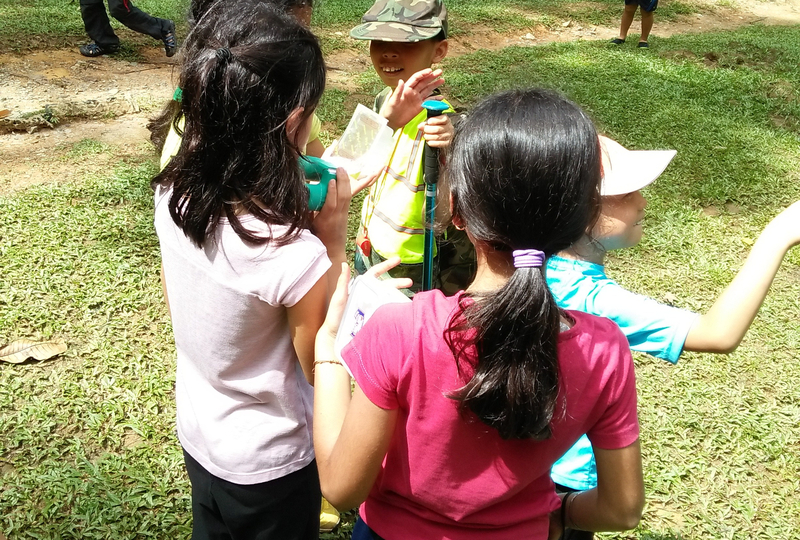 In depth: This is set to go down in Forest School Singapore history, as a milestone of how child-led learning takes place organically, spontaneously, without having to resort to farced role-play or artificial pre-set structures. Kids being kids, they would make mistakes, and quite easily so. In the usual classroom setting, if you found your crackers missing, you would just report to the teacher, and leave it to her to investigate (which would typically be firm reprimanding of the entire class, and exhausting much needless fierce authority to shame the ones committed the act). So what happened in Forest School during the Thornbill Thursday session was all the more miraculous, yet evident of how kids learn best through community-based bonding. Most of these kids have been regular in Forest School for a year or so, and they have learnt to take ownership of their own decisions, being independent explorers, and also sticking up for themselves to communicate to one another on how best to learn as a group. When the crackers went missing, they wanted to investigate not to look for someone to blame or shame; they simply wanted to find out the truth. Calmly, they genuinely set about logical and analytical pathways to decipher what happened, being thoughtful to not point fingers without solid evidence, and also realizing with empathy that it was probably an act done on impulse and without malice. The most heart-warming moment happened when Ananya held Kaeden’s shoulders firmly, bent over slightly to meet his eyes, and said with utmost compassion and reassurance, “Look me in the eyes, just tell me what happened. We would understand.” And that’s how she broke through all defenses, and Kaeden felt so safe and understood to admit that he ate the crackers. A small act, but with boundless heart and space for all to experience, learn and grow together. This is what forest school is truly about.